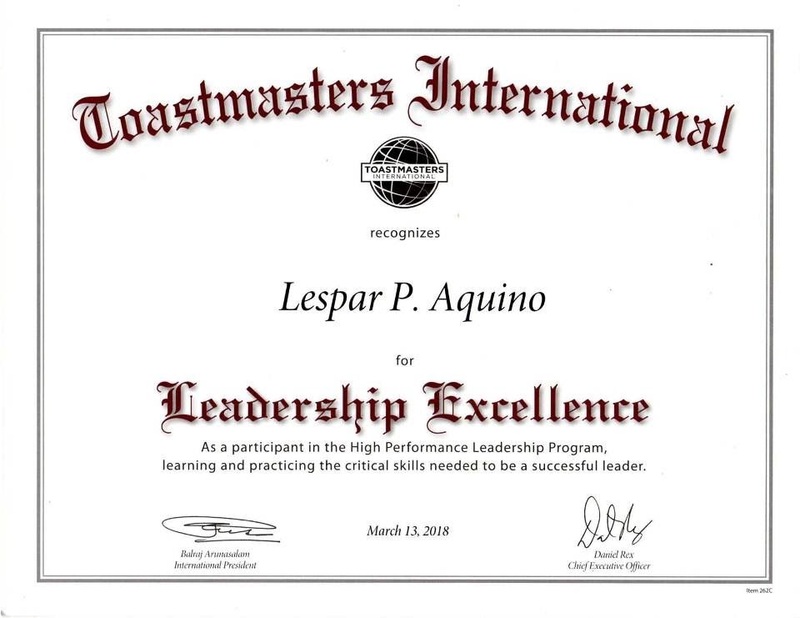 Shown below is the LDREXC Certificate as well as the Post-Workshop Milestones of the Public Speaking Workshops HPL Project. It is a continuation of the High Performance Leadership Program Milestones. Ching and Minnie fill-up and sign the Leadership Excellence Certificate (LDREXC) Application for the HPL during the workshop project activities. Russell fills-up and signs the LDREXC Application during the Toastmasters Club regular meeting which was held after the workshops. Raul fills-up and signs the LDREXC Application during the Joint Area Contest Division H 2017-2018. Ching submits her summary of the results of the workshops' evaluation forms. These are the evaluation forms that were filled-up by the participants at the workshops. Her summary will be part of the slides in the "Presenting the Results" HPL presentation. Les delivers the HPL final speech, "Presenting the Results", in the Mar.10 regular club meeting with Pres Leah evaluating. Les fills-up Option 3 of Project no. 9 in the Competent Leadership manuals of Ching and Russell. Option 3 is "Guidance Committee Member for Someone Who is Working on a High Performance Leadership Program Project". Ching and Russell will get credit for accomplishing Project 9 - Mentoring, in the CL Manual. Les gives the accomplished LDREXC application form and the "Presenting the Results" evaluation form to VP-Education Krissie for submission to Toastmasters International. Daniel Conyers (Education Awards Team) replies via email that the LDREXC application has been submitted for processing and to allow up to 5 days for its completion. After 2 days, the LDREXC has been processed. Les finally receives the Leadership Excellence Certificate in the mail (see above photo). This is also known as the High Performance Leadership Award.